This video shows you how to set up Apogee ONE in GarageBand and begin recording quickly. ONE, Mac OS 10.6.8 or greater and Garage Band 11. Next, name your song and save it. Click on GarageBand, Preferences, and then Audio/MIDI. For “Audio output” make sure “ONE” is selected. If selecting ONE, you will see a message asking if you really want to change the audio driver… Choose Yes. To experience the full audio resolution of ONE, select “Advanced” and for Audio Resolution select “Best”. Close the Preferences Window. Launch Maestro 2 located in the applications folder. Here you can select the different input sources of ONE. 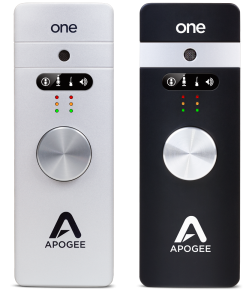 With ONE you can record one instrument and one microphone of your choice at the same time. For now, select Ext Mic. The instrument input is always on. Since we created a guitar track in GarageBand, we will plug a guitar into ONE’s quarter inch instrument cable. ONE can control input and output level with a single knob. Now just Plug in your headphones or speakers. Adjust your levels. Press record in GarageBand’s transport control, and begin recording. If you want to record vocals or an acoustic instrument, click on the plus button to add a new track. Choose real instrument. Make sure input source is set to ONE and monitor is set to on. Open Maestro. Change source to internal mic if you are using ONE’s built in mic, External Mic if you are using a dynamic or ribbon mic, external 48volt mic if you are using a condenser mic. Adjust levels, press record in GarageBand’s transport control, and begin recording.